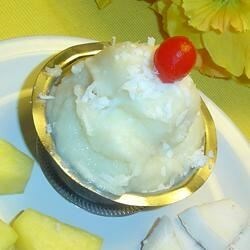 "This is my sorbet version of a favorite drink - Pina Colada! It's creamy, cool, pineapple-coconutty and a wonderful summer dessert. Enjoy!" Make a syrup by bringing the sugar and water to a boil in a small saucepan over high heat, stir and boil until the liquid becomes clear, about 1 minute. Set aside to cool. Blend the drained pineapple in a blender or food processor until very smooth and frothy. In a large bowl, whisk together the syrup, pineapple puree, coconut milk, and lime juice. Refrigerate until chilled, about 3 hours. Freeze in the freezer canister of an ice cream maker according to the manufacturer's directions. I followed the recipe exactly but it was not to my taste. Creamier than other sorbets because of the coconut milk, this is light, refreshing, and a nice balance of coconut, lime and pineapple flavors. Perfect just as written! excellent and very refreshing a keeper, I use a lite coconut milk to cut back on calories it turned out great. thank you. Very yummy!! I made this for a picnic and it was a total hit. It's very simple and oh so delicious! Don't change a thing! We love it. A little sweet but that can be adjusted.